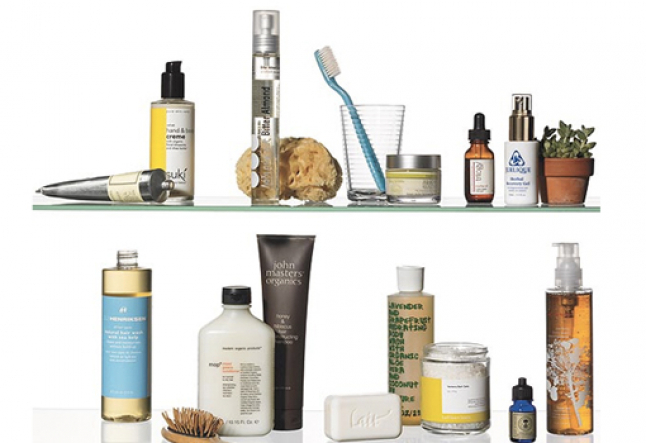 Home > Beauty > Tips > What’s In Your Body Care Products? By now we all know the ills of eating processed and junk food. But did you know that what we put on our body is just as important as what we put in it? The body’s burden may actually be more intense from skin absorption than from ingestion. Because skin is extremely permeable, chemicals applied topically will eventually find their way to the bloodstream. While exposure to just one chemicalized product alone is unlikely to do damage, repeated exposure to one or many just might. It’s the aggregate exposure that can lead to health issues. Today many of the personal care and cosmetic products on the commercial market contain an inordinate amount of deleterious chemicals. The FDA does not monitor the manufacturing of beauty products. Companies are not required to do any sort of safety testing before a product hits the marketplace. Nor are they required to verify their advertising claims. Subsequently, if the label says natural, pure, safe, hypoallergenic, fragrance-free, dermatologist tested, dermatologist approved, cruelty-free or organic, it oftentimes isn’t. Before you buy another product, learn to read the labels. Derived From: Waste animal carcasses (including slaughterhouse remains and euthanized animals) rendered in boiling water. Harmful Properties: Antibiotics, hormones, vaccines, pesticides, pharmaceuticals or diseases that the animals were exposed to are all included in the final commodity. Animal rendering factories are notorious for releasing pollutants into the air and nearby water supply. Harmful Properties: Skin, scalp and eye irritants, and suspected as a gastrointestinal and liver toxicant. The bigger issue is that SLS may be contaminated with 1,4 Dioxin, which is carcinogenic. Harmful Properties: Dioxane is absorbed through the skin or via the respiratory system when inhaled. It is classified by the EPA as a carcinogen. Harmful Properties: Formaldehyde is a known carcinogen, respiratory and eye irritant, and skin allergen. It is destructive to the environment. Harmful Properties: DBPs are known to disrupt normal hormonal processes and have been found to cause a wide range of birth defects. Harmful Properties: These chemical preservatives are “estrogenic” (mimics the function of naturally occurring estrogen) and disruptive to normal hormone function. Exposure to external estrogens has been shown to increase risk of certain cancers. Harmful Properties: Skin irritants, capable of initiating an immune system response that includes itching, burning, scaling, hives and blistering. Probable carcinogen. Harmful Properties: Known carcinogen. Highly irritating to eyes, skin and the respiratory system. Harmful Properties: Eye, skin and respiratory irritants. May also cause kidney and liver damage, and may weaken the immune system. Probable carcinogens. Harmful Properties: Suffocating to the skin, petrolatum prevents skin from performing its natural cycle of breathing and eliminating. Carries a risk of contamination with toxic impurities, some of which are linked to cancer. Harmful Properties: Irritating to skin and eyes. The topical use of mineral oil accelerates free, radical damage to the skin and is thought to be detrimental to the immune system. Used For: Penetration, enhancer, lather and humectant. Harmful Properties: Neurotoxin that is damaging to the liver and kidneys. Also acts as an allergen that triggers contact dermatitis. Used For: Softness and ability to absorb oil and moisture. Gives powdered cosmetics their consistency and slippery quality. Harmful Properties: The International Agency for Research on Cancer considers talc a carcinogen. Used For: Adds pigment to hair. Coal tar in shampoo eases dandruff. Used For: Helps polish go on smoothly and adhere evenly to the nails. Harmful Properties: Strong skin, eye and respiratory irritant. Known as a neurotoxin and possible carcinogen. Harmful Properties: Developmental and reproductive toxin. Easily absorbed by the skin and has a tendency to accumulate in the body. Can cause skin irritations on contact and allergic and neurotoxic reactions. Commonly Found In: Liquid soaps, deodorants, hand sanitizers, cosmetics, and skin care treatments. Harmful Properties: May promote antibiotic resistance, cause skin and eye irritation, and disrupt hormones in humans. Harmful Properties: May cause acne, and are known as skin, eye and respiratory irritants.